Opera News – an Africa news app, has been updated with loads of new features that allow football audiences to stay ahead of the World Cup 2018 in real time. Football fans among Opera News users will now be able to choose their favorite team and follow all the updates of the competition with live scores and kick-off reminders for every match. 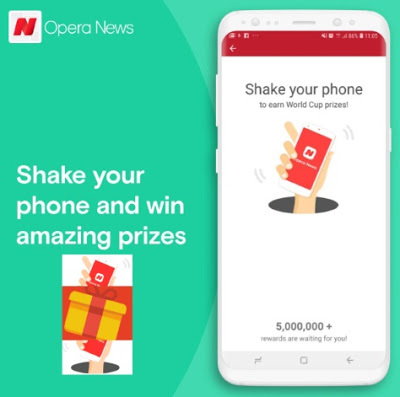 To celebrate the World Cup, Opera News is organizing a giveaway in partnership with Jumia, the largest online store in Africa. Users can win World Cup Prizes that can be exchanged for amazing prizes like, a brand new motor car, smartphones, Jumia Voucher Supabets Voucher and free airtime just by shaking their phones during World Cup matches when using Opera News. Not only that, you can still refer to get Data and Airtime! Tecno Spark 2: You can win this smartphone for free and it will be transported to your location. All you have to do is to collect the 9 pieces on the screen. 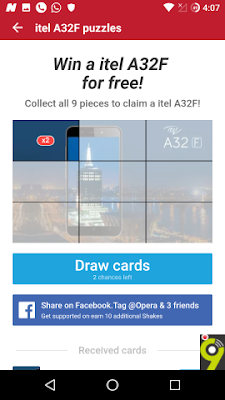 It can also be collected easily when you shake your phone to win prizes or share on Facebook and tag @Opera with 3 friends to get chance to win it. itel A32F: This entry-level smartphone can be collected easily by just collecting the 9 pieces on the screen. It's free. Tecno Coupons, Jumia, and Superbets Voucher: Assuming you want to buy a new product from Jumia or bet on Superbets, you can easily use a voucher or a coupon to reduce the price of the product. Kia Rio 1.4 LX: The fourth generation of Rio is among the giveaway Opera News World Cup Prizes. You can be the luckiest person to win a brand new Kia Rio 1.4 LX. 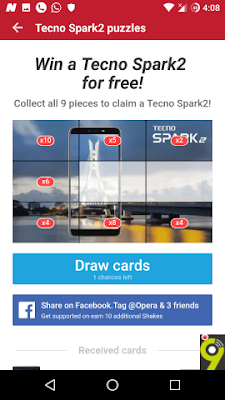 To enter, you have to collect the 9 pieces on the screen, which can be done by shaking your phone to win rewards and share on Facebook and tag @opera with 3 friends to get free chance to win it. Data and Airtime: These can be gotten by shaking your phone or referring your friends to the app. You get N50 for each person you referred. You can win more than 3000 points per shaking which is even more than N50 reward per referral, the more you shake the more you win. The Shake giveaway will be accessible during all 2018 World Cup matches while in regulation time (from kick-off until the final 90 minutes of each match). Download and register on the Opera News app by clicking here. Once all puzzle pieces are collected, click on “Exchange” and submit your contact information, Opera News team will contact you within 3 days. “Oops, no gift this time” – Shake again! Redeem your prize immediately or continue collecting puzzle pieces. Opera shake is a free prize giveaway offered by Opera Software AS, a company based in Norway. 1. There is no cost to participate in Opera Shake. To be eligible to win, simply download Opera News and follow the in-app prompts. 2. By participating, you agree to the Contest Rules available at http://www.operasoftware.com/portal/contestrules, which are incorporated herein by this reference. 3. The contest will be open from June 14th – July 31st and is available to participants who are 18 years and older and are legal residents of Kenya, Nigeria, Ghana or South Africa. Legal Identification is required to claim any prizes. 4. The winners will be drawn at random from eligible entries. Winners will need to log in to the Opera News app and provide some basic personal information to claim their prize. By providing us with this information, you are consenting to allow us and our partners to collect, access, and transfer your personal information for the purposes of conveying your prize to you. 5. Prizes may be provided by our fulfillment partner Jumia (Zando). 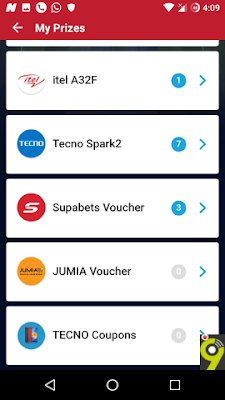 Jumia (Zando) and/or other fulfillment partners will contact winners promptly by SMS, instant messaging, phone, or email.